This charming series tells you everything you need to know about kitchen garden produce from earliest history, through the garden and into the kitchen. Tomatoes are a fruit we treat as a vegetable, an edible plant that was, for years, grown only as an ornamental, a close relative of deadly nightshade and yet delicious to eat; they are full of inconsistencies. They are one of the foods that really taste different home grown. A tomato warmed by the sunshine and eaten fresh off the vine is so far removed from a pre-packed supermarket specimen that it is hard to believe they are the same fruit. They can be grown in a vegetable plot or in amongst flowers and will enhance any site. Tumbling varieties can be allowed to cascade out of baskets or over the edges of raised beds, bush ones will provide upright structure all summer long and cordons will climb to almost indefinite heights. As they ripen many of the fruits are beautiful, with a wide range of colours, stripes and patterns. 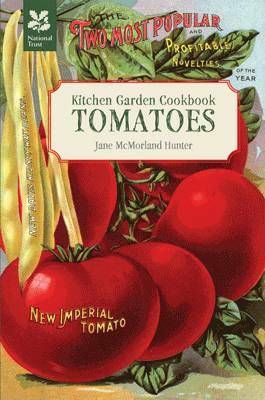 In the kitchen tomatoes are incredibly versatile, adding taste and colour to innumerable meals. You can eat them raw or cooked, they can be dried or frozen, or made into dishes as varied as salsa or sweet custard. One of the main reasons for growing your own is that you will get the truly fresh flavour that vanishes once tomatoes are packaged up for sale.